Nourish and revitalize dry, overworked hair with this ultra nourishing conditioner. The lightweight formula is perfect for all hair types. It hydrates extra dry hair, smoothes frizz and softens brittle hair. 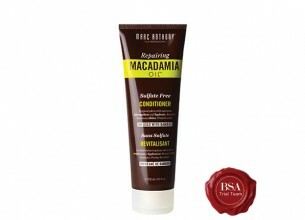 Macadamia Oil moisturizes extra dry hair, boosts shine and improves elasticity while Bamboo Extract imparts strength. This product is very effective! It worked wonderfully. This product is meant to nourish my hair and eliminate frizz. It did so very successfully. It provided my hair with shine, banished frizz and nourished my hair. The packaging is attractive and nice and big. I like that it is a squeeze bottle, so that you can control the amount of product you squeeze out of it. It smells amazing! It is a fresh, sweet smell. I loved it. It was very creamy but it was light enough that I was able to work it through my hair easily. A little goes a long way. It worked so well for me. I have been testing out the Marc Anthony Repairing Macadamia Oil shampoo and conditioner for the past few weeks. I absolutely adore these products. It smooths and softens my hair enough so that I don’t have to blow dry or straighten my hair to get rid of frizz, I just towel dried and still got complimented on my hair today! It is very good quality for the price and it smells great. I recommended it to my mom and she loves it too. She colours her hair monthly and she said she noticed that the colour seemed to stay more vibrant for longer. The packaging is user- and travel-friendly. The shampoo and conditioner are light and spreads easily through my hair. I would recommend this product to dry, frizzy, damaged, and colour-treated hair, however, it might not be ideal for very fine hair.